We forgot to take ‘after’ photos last weekend, after we did massive cleanout of debris from the kitchen ‘patio’ area, so we took some this weekend. We also cleaned the area at the top of the stairs on the other side of the house, as well as some other small jobs. 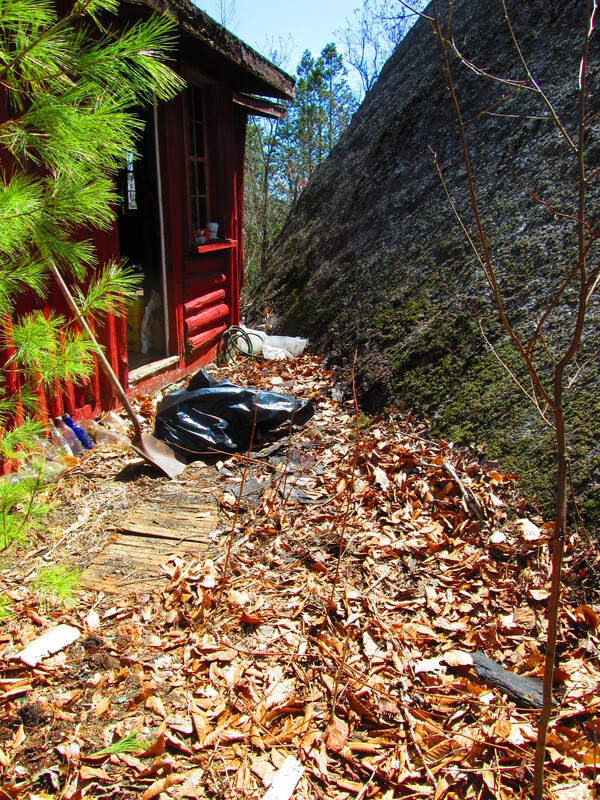 It actually makes a huge difference to clear everything away from the house and de-crap the woods areas immediately surrounding the cabin. Everything is just junk on top of junk, so we dig till we find only soil. Takes a few layers and a lot of contractor bags to get there! The previous owners put a lot of plastic sheeting everywhere, which is nasty. But, typically there’s no trash below the plastic layer. 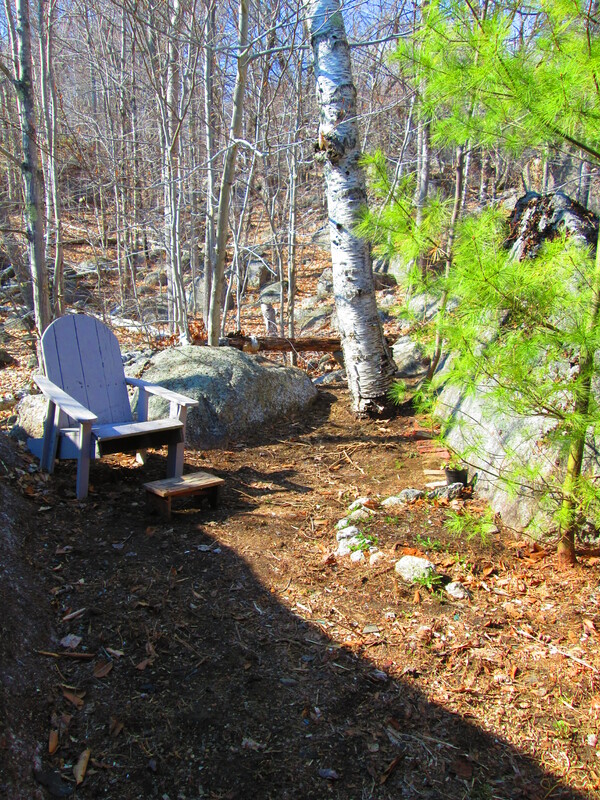 Making progress, and ending up with some pretty sweet places to sit and relax outdoors. Three woodpeckers had an epic battle for territory right over our heads, and we heard loons on the lake this weekend. Superb. Before: Little tiny cranny. Plastic, shingles, goo. After: cranny is clean. Inspected too! 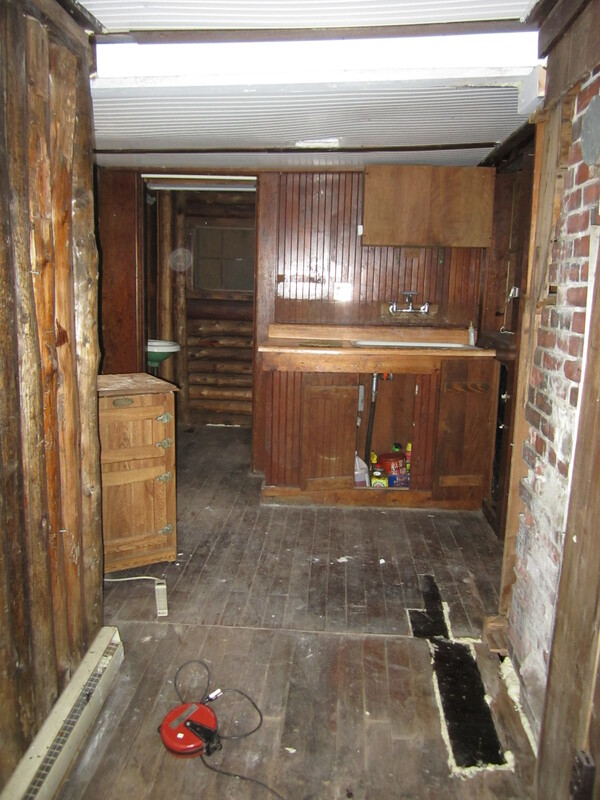 After: the horror within the cranny. We knew this was here. 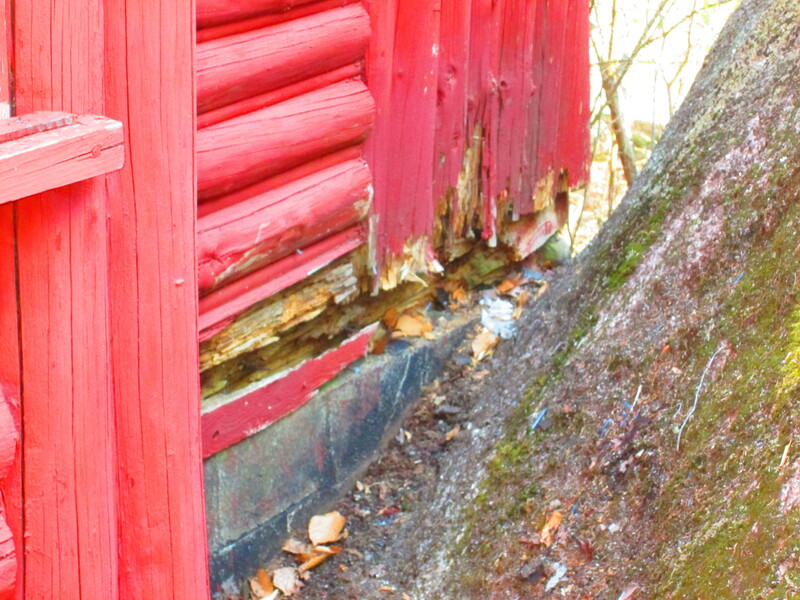 Plan is to jack, replace sill, probably bring up the stonework to keep snow from doing this again. Before-ish: The kitchen patio, we’ll call it. 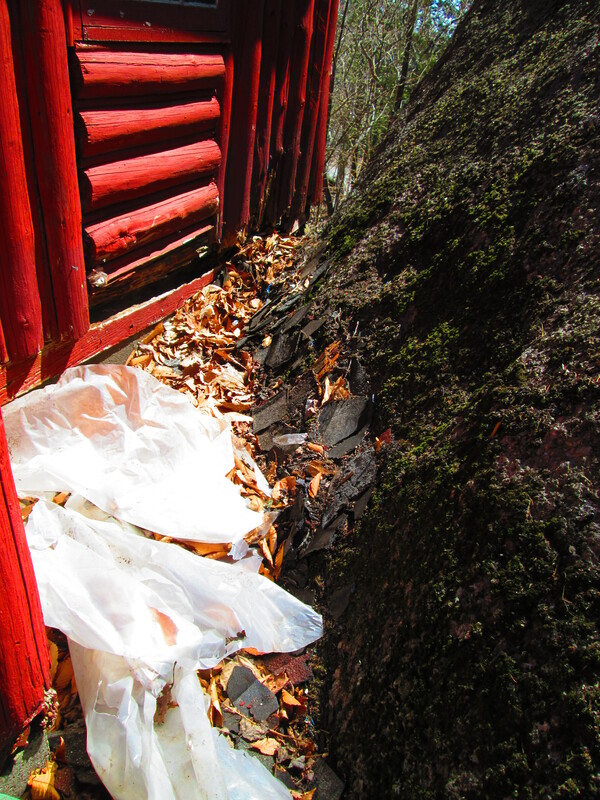 I had already pulled many bags of trash, shingles, junk out & sent it to the dump. Uncovered useless wood walkway. 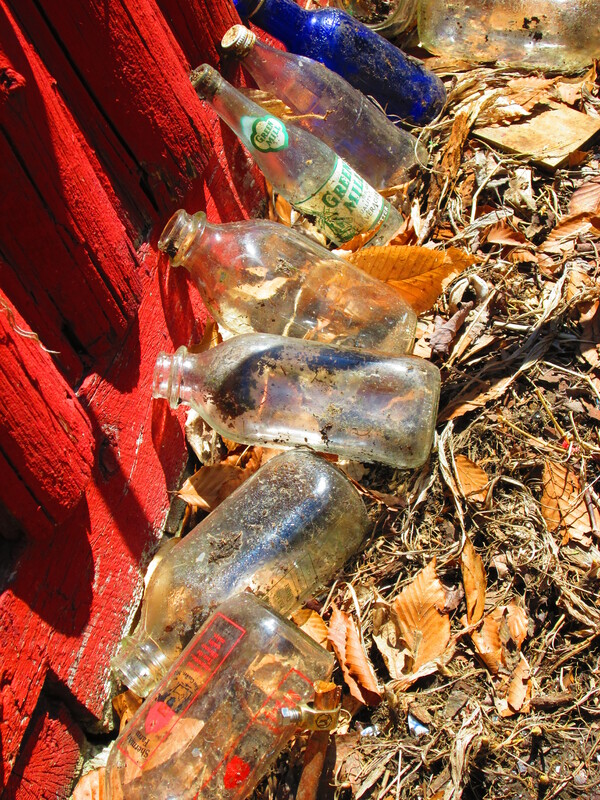 Found under shingle pile: lots of cool old milk and other bottles. Also, an 8″ chef’s knife, dish drainer, colander, veggie chopper, etc. Basically, contents of kitchen. After: Kitchen patio, cleared and with (free from side of road) chair. There’s evidence of an old herb garden on the right. Salvaged some thyme and a pot of hens & chickens. Quite a lovely and private nook! 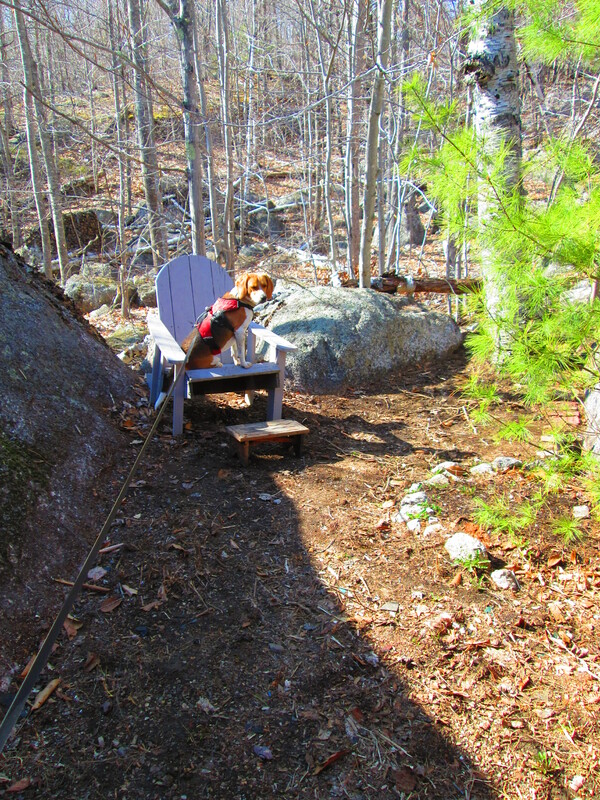 After: pretty much same view, no dog. So pretty, though, I had to post twice! 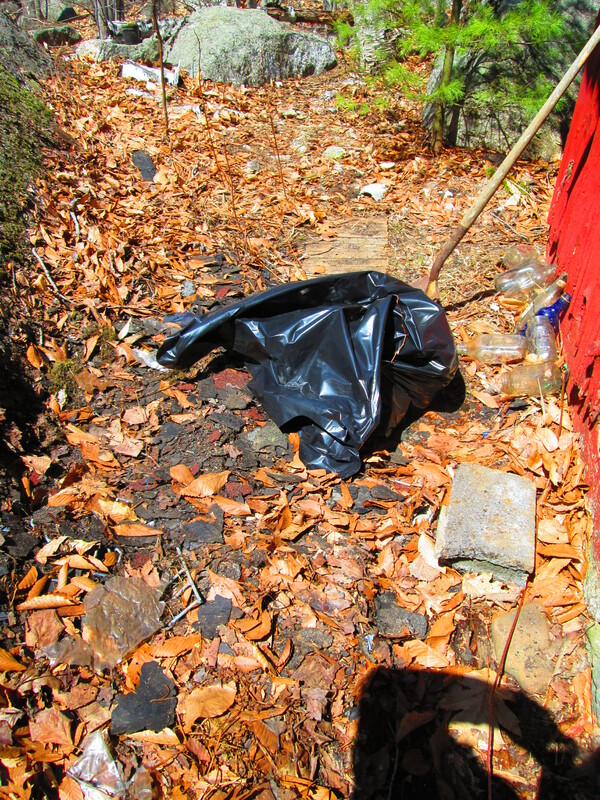 After: we did this cleanup this weekend. 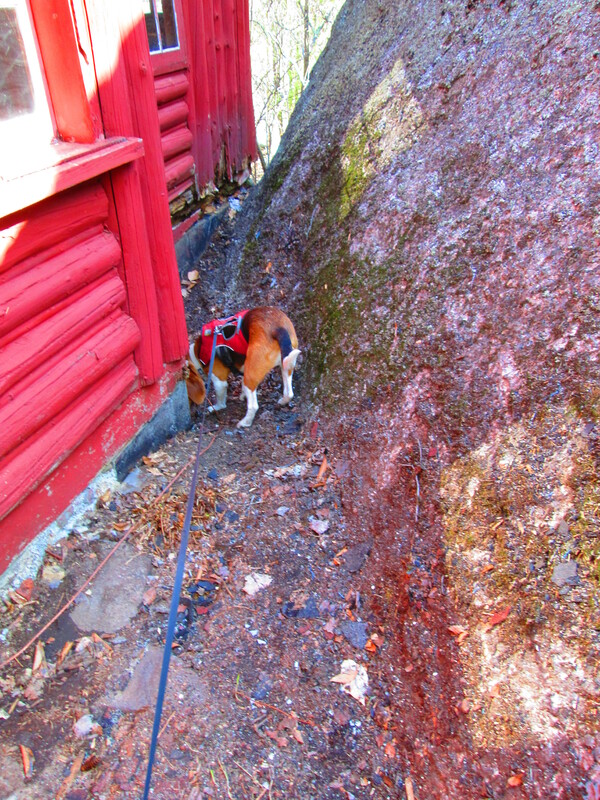 There was about a cord of mostly rotted wood under the fern rock. Plus, cinderblocks, grills, and a retro fork! We think they built a fire pit under the rock then just let it collapse. 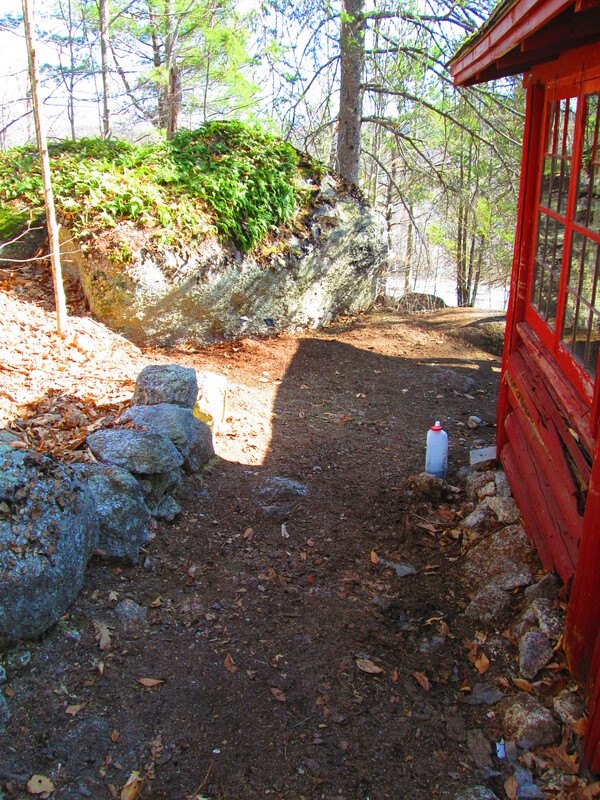 Path got cleaned too, removed plywood and we’ve been picking up broken glass and depositing it in the glass jug, seen at right. It’s about 1/4 full already. 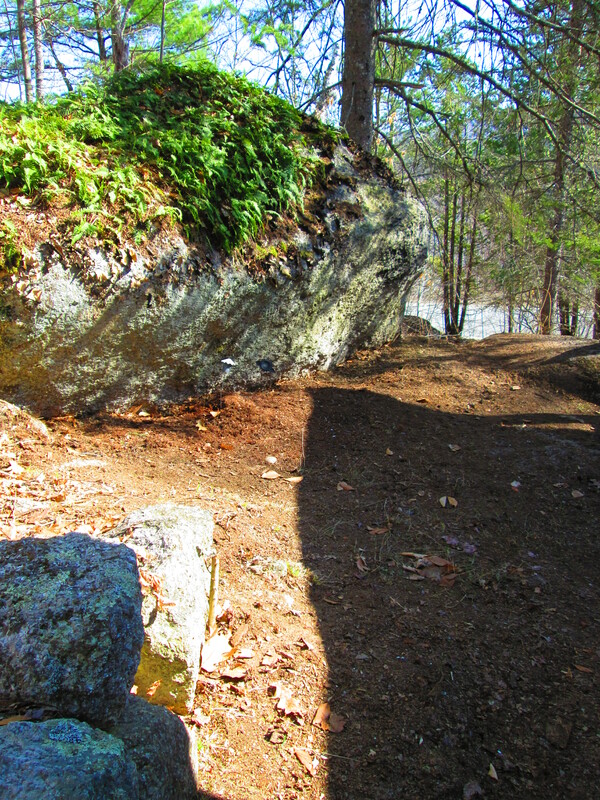 After: closer up view of the fern rock. This is a really nice spot now. And so clean! There were seriously about 25 cinderblocks crammed under the overhang. Two quick trips out this weekend, mostly to do garbage duty. We did a pretty massive cleanout of the back ‘yard’, took before pictures, and forgot to take after pictures. So, more on that next time. 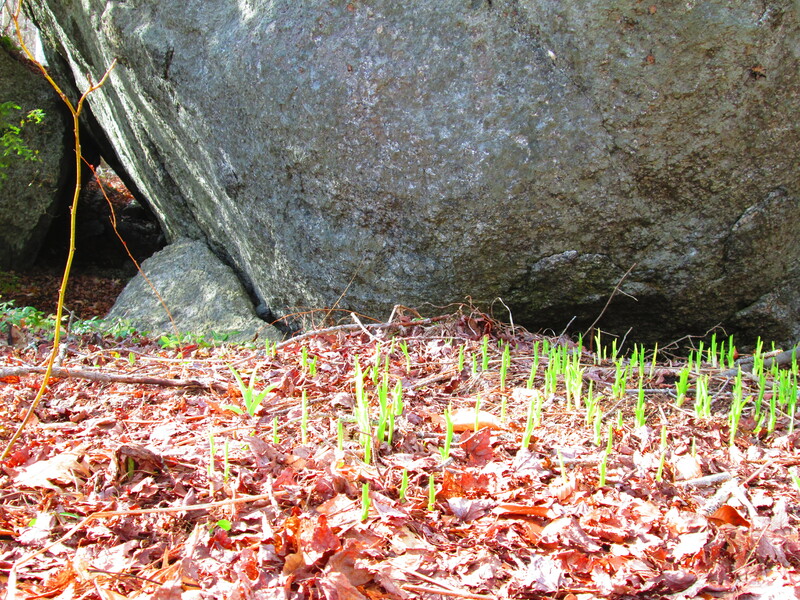 But maybe the best part of this weekend’s cabin experience was finding bulbs and flowers popping up everywhere. We half-expected some nice old-fashioned gardens, and were ecstatic to see the forest floor bristling with fresh green spikes. 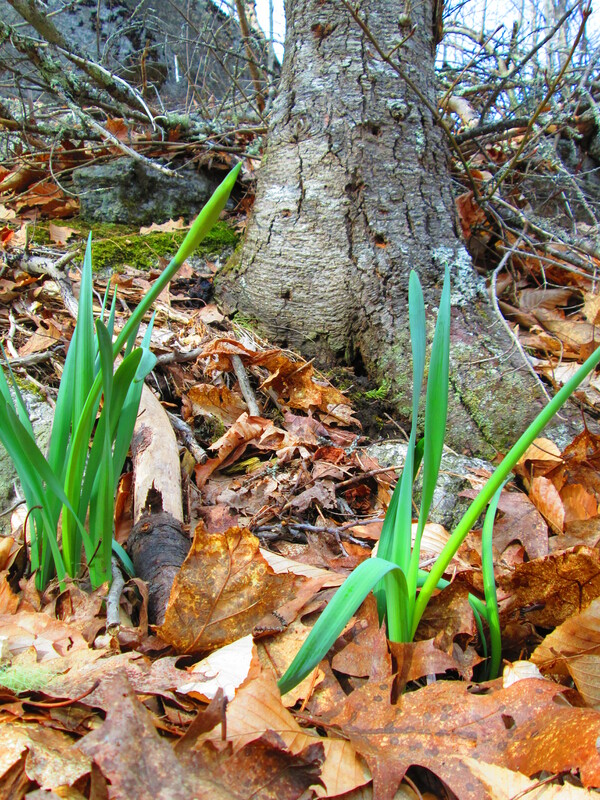 A couple of daffodils are getting ready to open. Not sure what they will be, but they are a welcome sight! We also installed an old window sash stay so we can open the back bedroom window without the wind slapping it around. 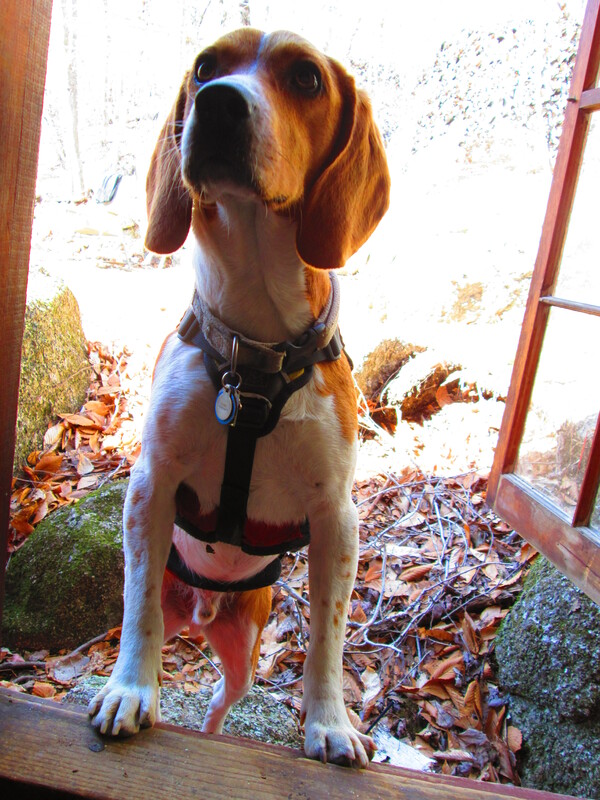 It’s a huge window, and really can be used as a door to the backyard. Someone discovered it today. Bedroom window = back door. Two big things got done this weekend. 1. Tub and toilet left the bathroom. Tub thanks to a wonderful friend. One of us (who shall remain nameless) could not quite hold up their end of it last weekend, so we called in reinforcements. Full bathroom suite. 100% non-functioning. 110% gross. 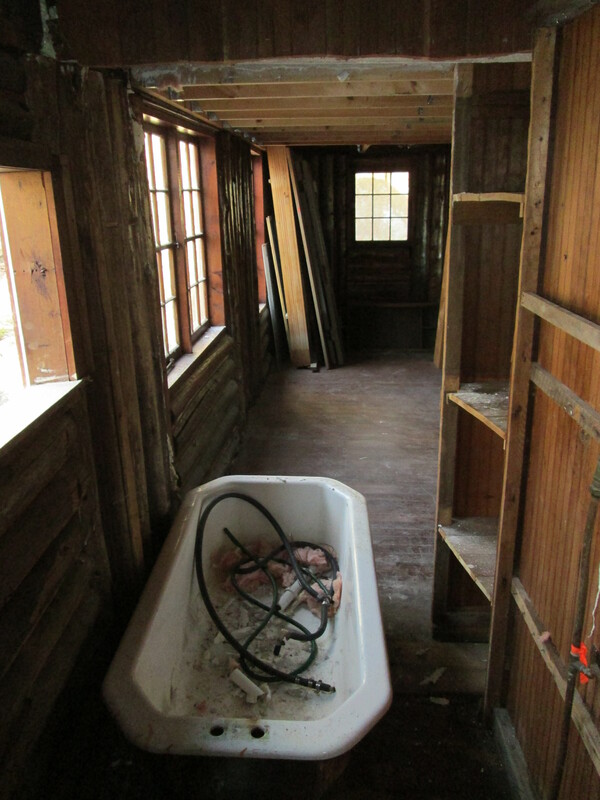 Minus tub, post-vacuuming. Getting better (ish?). Just the non-functioning sink left. It’s cute, but beyond repair for us. Too many cracks in the enamel. 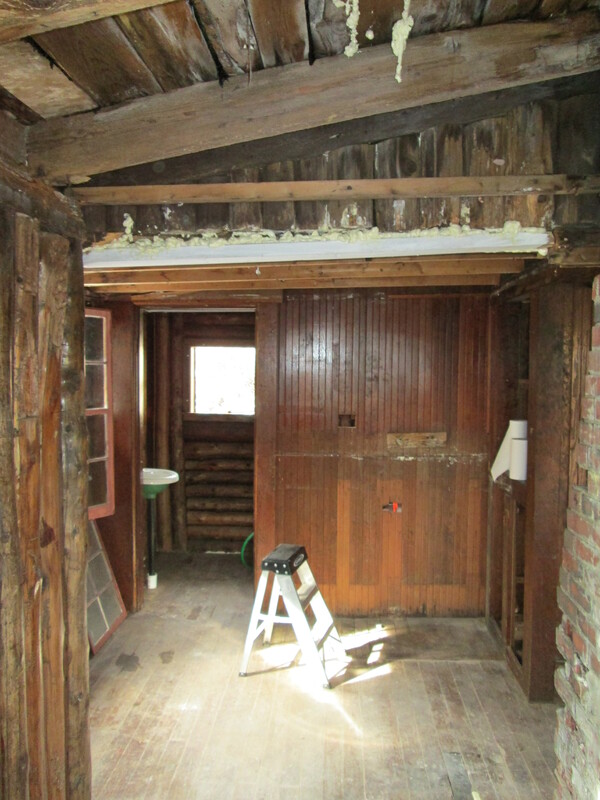 We will try to sell it to a more ambitious renovator. Sadly, this meant re-filling the trash/recycle pile a bit. 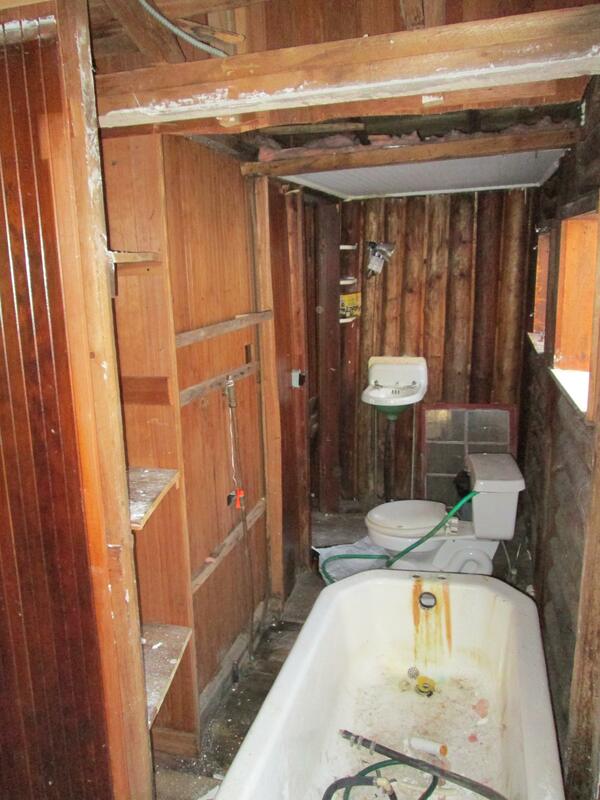 At least the tub can be sold for scrap metal. Tub, in its temporary resting place. 2. We cut a hole in the front wall of the loft, which lets light and air all the way through (and will ultimately make for much more functional design). Loft is open! Look at that drywall job. Wow – speechless. 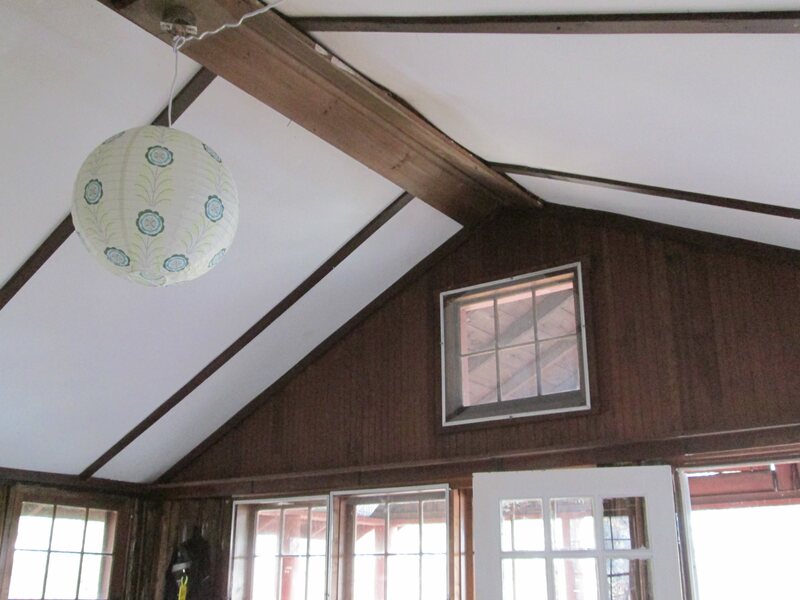 Loft, open and without drywall! 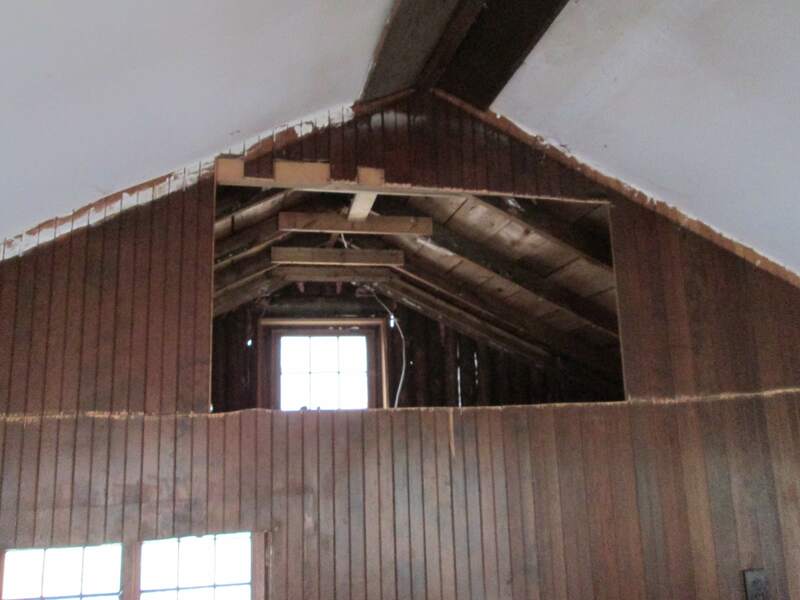 Stripped to the rafters, which look amazing and dry, like the sheathing above. 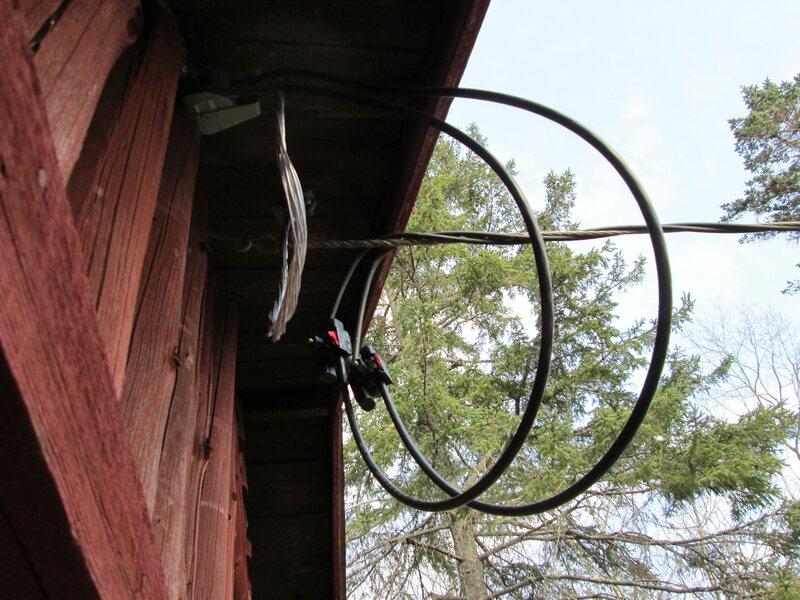 Phew – one non-leaky area! After a disgusting session of vacuuming, it smells and feels a bit better in the house. We’re not sure it looks better yet, but we’ll get there. The wood man came and took away all our wood scraps/demolition spoils. Love Freecycle! The pile is just about gone…for now. If it doesn’t snow too much tomorrow (!) 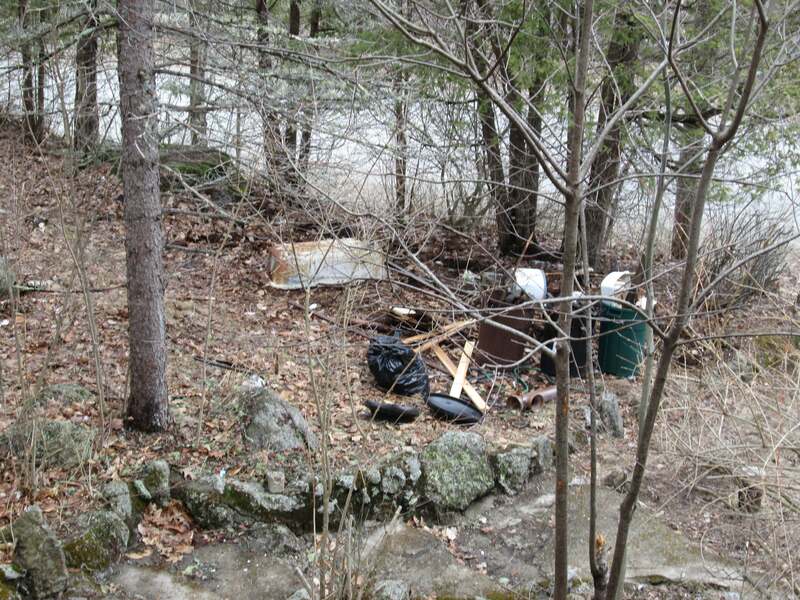 we can rake up the rest of the debris and call it clean. Woo hoo! Beautiful service drop. 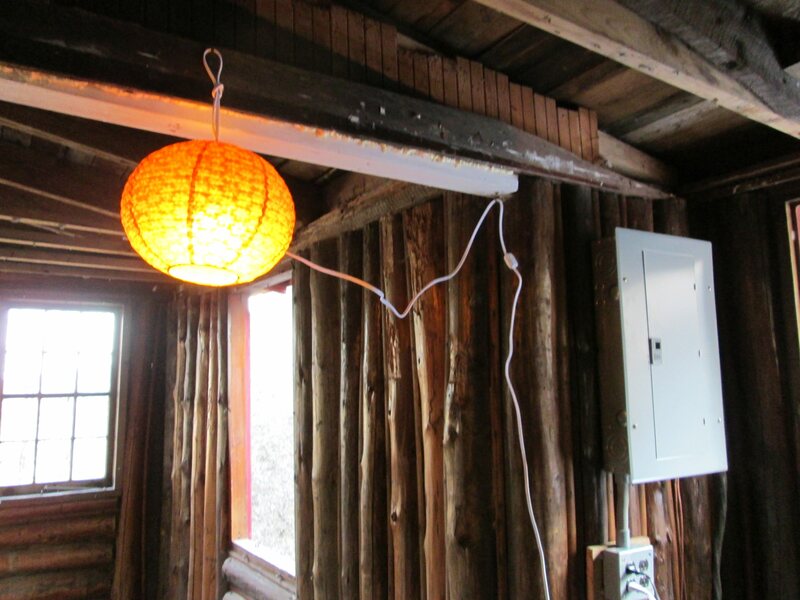 We will be glad to get an electric bill! 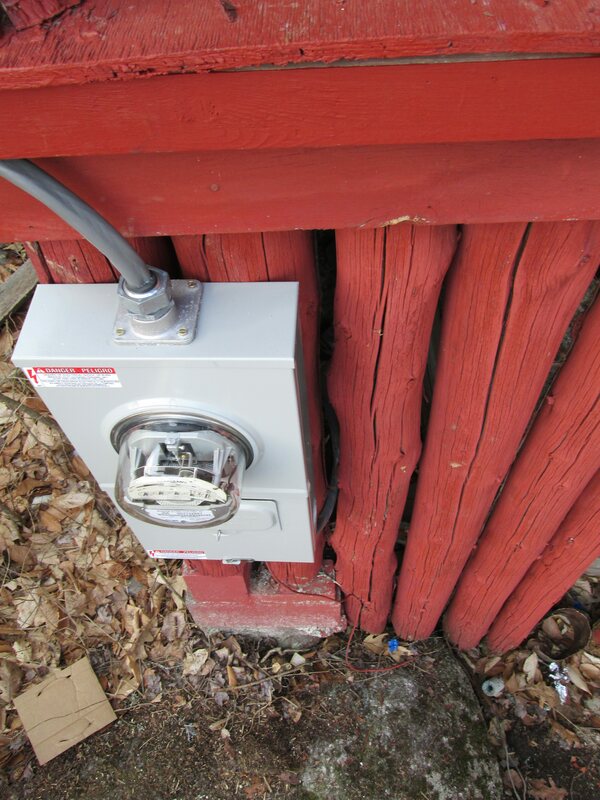 Brand new meter head. Looks just like the old one, but this one is wired properly and has NOT been on fire. Knock on wood. Temporary lighting fix for now. This is the future kitchen/dining room. In fact, it’s way better than the Brady-bunch style horrifying ceiling fan. We would be nowhere without rice paper lanterns. Not sure where to begin. 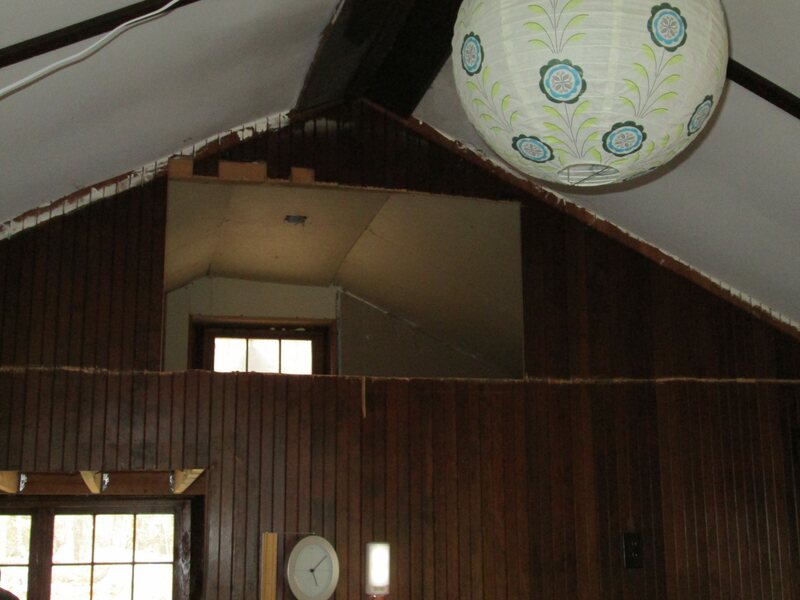 With the snowmelt-soaked insulation we found above the kitchen ceiling? Many mouse nests hidden in the wood around the chimney? 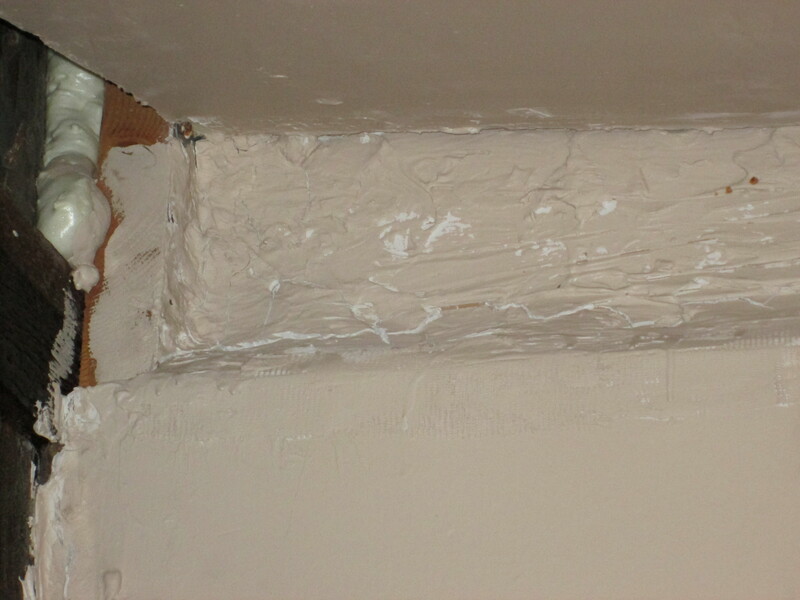 The unbelievably bizarre construction methods including a 4-inch schmear of some sort of caulk standing in for a piece of drywall? This was a major demo weekend. And it was gross. Gross enough that we both donned the dorky shower caps I have been collecting from hotels recently and beat a quick retreat home to the shower as soon as the trash was bagged. Some photos from the weekend’s (disgusting, but so very cathartic) work. 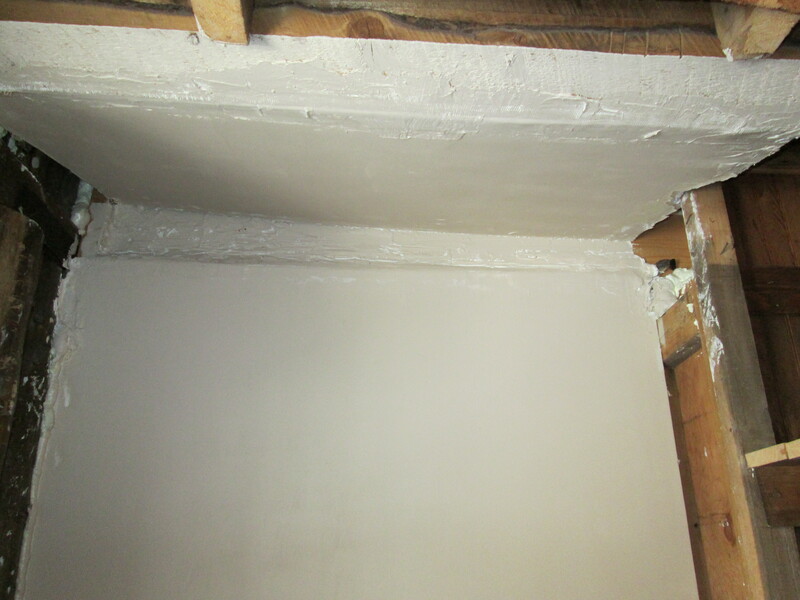 Bathroom drywall – this is part ceiling, part wall behind the tub. The point where the 2 pieces join – see below for close-up of goo. And here is the goo. Scale = about 4″ x about 48″ long. Some spray foam, some silicone, maybe? And, of course, painted to look pretty. Fail! 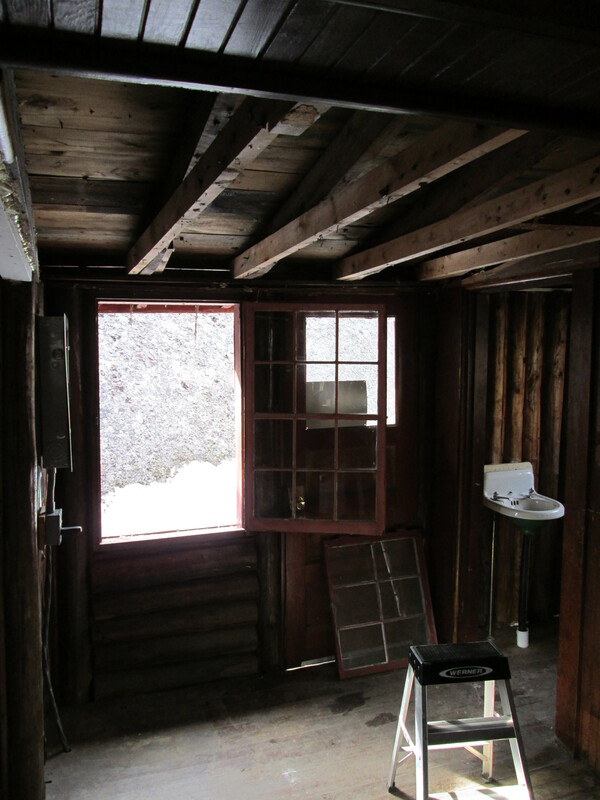 Bathroom – not private anymore! Also not full of garbage drywall. From dining towards kitchen, after crap removed from ceiling! Why box in all that headroom? Silliness. Kitchen area, after. Airing out. 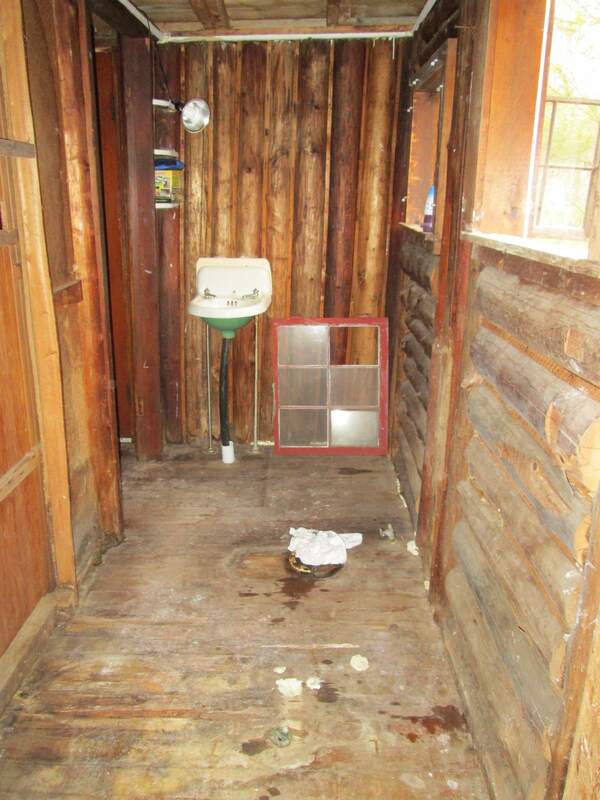 This area had about 2 gallons of water pooled on top of crappy fake beadboard. Oh, what fun when it came pouring down! Luckily, we anticipated it and had plastic sheeting down. 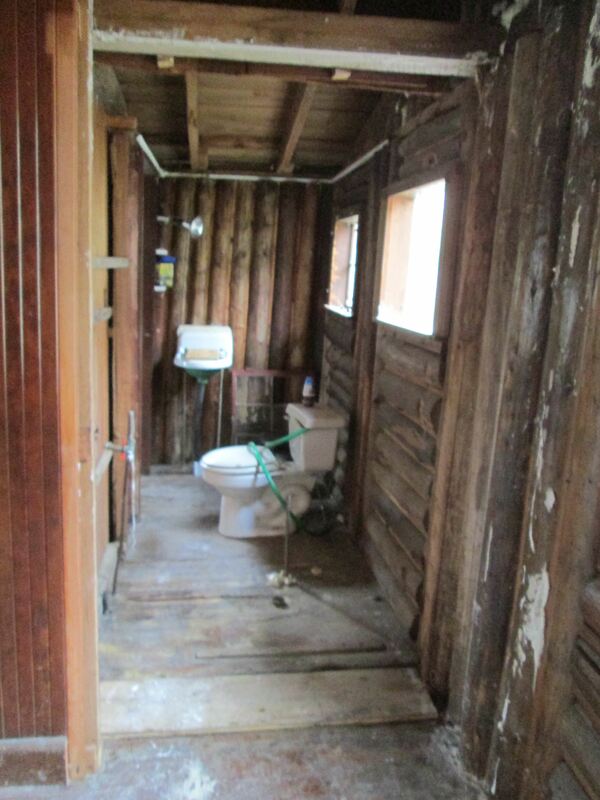 p.s., the cabin smells, feels, and looks better already. Quoting a favorite movie (the Birdcage), this has become our renovation mantra in all of our projects: “Don’t add, just subtract”.